Destroyermen: Into the Storm by Taylor Anderson. Roc Books. 386 pages. I’m a big fan of alternate history stories. I am also a fan of military sci-fi. When I can find a book–better yet, a series–that combines these two, and does it well, I am in reader heaven. 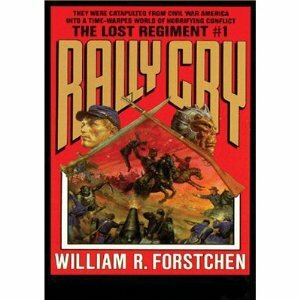 Years ago, I read The Lost Regiment series by William Forstchen, and fell in love with it. This book, and the series it belongs to, reminded me very much of that series. 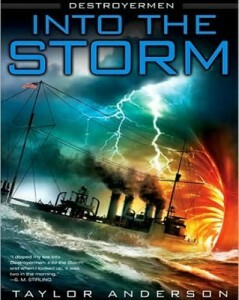 Whereas The Lost Regiment tells of a U.S. Army regiment returning to the north during the American Civil War that inexplicably is thrust through a portal into another, parallel world, Destroyermen has the same situation, but from the perspective of a ancient U.S. destroyer in the beginning days of World War II. Both are thrust into world where they are grossly outnumbered by a horrific race that finds humans–and other beings–tasty and has no other use for them. In the situation of Destroyermen, Anderson introduces 20th century technology and warfare to a world where 17th century is considered cutting edge. But just the fact that they are overwhelmingly outnumbered by a savage race makes it interesting. The book, and I assume the series too, is well written. I especially like the opening detail of life in 1942 on a U.S. destroyer. Anderson does a good job of making you feel that he really knows that life, and having those otherwise mundane details is critical when it comes to taking the step toward the unbelievable. When the sailors of the U.S.S. Walker first meet the aliens–the good aliens, not the evil ones–one gets a sense of how alien they really are. The Walker sailors bring not only 20th century technology to the new world, but tactics that had advanced a great deal since the 17th century. There’s even a love interest–more than one, actually, if you include the aliens. The only problem I saw with this book was the author’s habit of switching point of view in the story. Perhaps he thought it was the only way to be thorough in telling it, but I found it confusing to switch a half dozen times in each chapter. More than once, I found myself going back to the beginning of a section to see who was telling that part of the story. I have had a habit in the past year of reading the first book in series, just to see how the author does their craft. I am so backlogged on books to read that I pledged to my wife that I would read five more books before I bought any more. But Destroyermen is a series that intend to follow. The characters are likeable, the situation is plausible (for the genre), and the detail is believable.